KIEV, Ukraine -- Almost seven months ago, in Belarus, the leaders of Russia, Ukraine, France and Germany brokered a ceasefire agreement, known as Minsk II, which mapped out a path to a permanent resolution of the separatist conflict in eastern Ukraine. A girl holds the Ukrainian national flag during a welcoming ceremony of paratroopers, who returned from the frontline in Eastern regions, in Kiev, Ukraine, September 4. Putin’s occupation of Ukraine is in danger of becoming permanent, like the two Koreas, the author writes. Although sporadic shelling has continued, the agreement has provided respite from the intense combat that prevailed through much of 2014. Unfortunately, the eruption of violent protests in Kiev last week, in response to the Ukrainian parliament’s consideration of a decentralization bill granting greater autonomy to Donetsk and Luhansk oblasts, seems to suggest that a permanent resolution is still a long way off. Yet the United States can certainly bring pressure to bear on both Ukraine and Russia to reach a permanent settlement. In the absence of such an agreement, two unattractive scenarios are imaginable. The intense fighting that preceded the Minsk II agreement could resume. 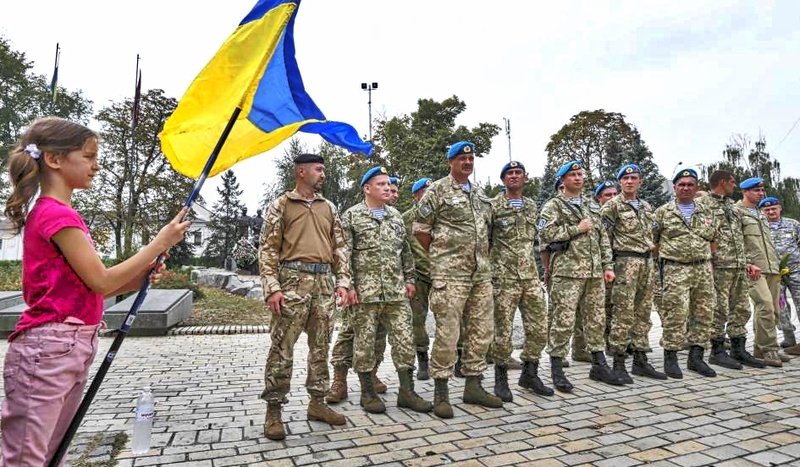 Or, as other commentators have pointed out, the indefinite continuation of the tenuous ceasefire could turn into a “frozen conflict,” in which western Ukraine and the Donbass coexist as separate, rival entities. On the surface, that second scenario might not seem like such a bad outcome. After all, the ongoing separation of China and Taiwan, and the division of the two Koreas (still technically observing an armistice in the Korean War) are perhaps the two most notable frozen conflicts. And even though the rival parties still engage in periodic military posturing, China, South Korea and Taiwan have enjoyed impressive economic development over the past few decades—in addition to political development in the latter two cases. Unfortunately, a frozen conflict in Ukraine is unlikely to resemble those in East Asia. The progress that China, South Korea and Taiwan have achieved is due, in part, to the stability that resulted from the security guarantees that the United States has extended to Taiwan and South Korea. In the current crisis, however, it is difficult to envision the United States making any comparable security commitment to Ukraine. A frozen conflict in Ukraine would therefore be much more similar to those in Georgia and Moldova. In those countries, the ongoing presence of Russian security forces in separatist Abkhazia, South Ossetia and Transnistria has essentially scuppered the near-term prospects of joining western institutions such as the European Union. Moreover, Russian-sponsored organized crime in the breakaway provinces continues to impede political and economic development. Since Ukraine’s development thus depends largely upon its preservation as a unified state (excluding Crimea), it is imperative to finalize the political settlement laid out in the Minsk II agreement. Of course, there is significant reluctance on both sides to do so. The violent protests on August 31 demonstrate that Ukrainian nationalists staunchly oppose granting greater autonomy to Donetsk and Luhansk. Rebel leaders are reluctant to relinquish the authority they have seized. And Moscow, as others have hypothesized, may want to weaken Ukraine by fostering a frozen conflict there—as it has done in Moldova and Georgia. Given those reservations, the United States should do more to incentivize the rival parties to reach a permanent settlement. To begin, Washington should encourage Ukrainian legislators, in spite of the recent protests, to approve decentralization legislation. That will certainly be a difficult case to make. But the West has leverage. The International Monetary Fund (IMF) has offered Ukraine a loan package of about $17.5 billion, the lion’s share of which has yet to be released pending Ukrainian debt restructuring and economic reforms. In addition, the United States and European Union have each extended loans of about $2 billion. Yet the IMF estimates that Ukraine will likely require an additional $40 billion in external financing over the next four years. The Obama administration should therefore make clear (and lobby European allies to do likewise) that any additional assistance will be contingent upon Kiev’s implementation of Minsk II—particularly with regard to decentralization. Although the United States has little leverage over the rebels, it does have leverage over Russia in the form of a comprehensive set of economic sanctions. Up to this point, those sanctions have largely failed as a means of coercive diplomacy. But that failure is due, primarily, to the fact that Washington has made their repeal contingent on actions that Putin is clearly unwilling to contemplate—such as turning Crimea back over to Ukraine. The Obama administration must not allow principled opposition to a fait accompli in Crimea prevent resolution of the ongoing standoff in the Donbass. Since the Russian economy is in dire straits, the prospective repeal of sanctions constitutes an enticing carrot that the West can use to entice Putin to cooperate in negotiating a permanent settlement in Ukraine. Provided that Kiev passes legislation granting greater autonomy to Donetsk and Luhansk, the United States should offer sanctions relief if Moscow upholds its commitments under Minsk II. Russia would need to withdraw its troops from the Donbass—a concession which should not be overly embarrassing for Putin, since he denies their participation in the conflict. In addition, Moscow must compel the separatists to lay down their arms, and restore Ukraine’s control of its external borders. That may be difficult since it is unclear how much control Russia currently exercises over the rebel leadership. Yet the genuine prospect of sanctions relief would certainly increase Putin’s motivation to pressure the rebels to implement Minsk II. Such a quid pro quo would help make a permanent settlement of the Ukrainian conflict more attractive to Putin than another frozen conflict. He would be able to claim that he succeeded in protecting the rights of ethnic Russians in eastern Ukraine, and also prevailed upon the West to remove what many Russians view as unjustified sanctions. In essence, the United States must be willing to grant Putin something he will surely portray as a victory. Unpalatable as that may be, it is certainly preferable to an indefinite continuation of the Ukrainian conflict.